JUST TWO DAYS UNTIL THE PRE VALENTINE’S NETWORKING EVENT FOR PROFESSIONALS & ENTREPRENEURS. 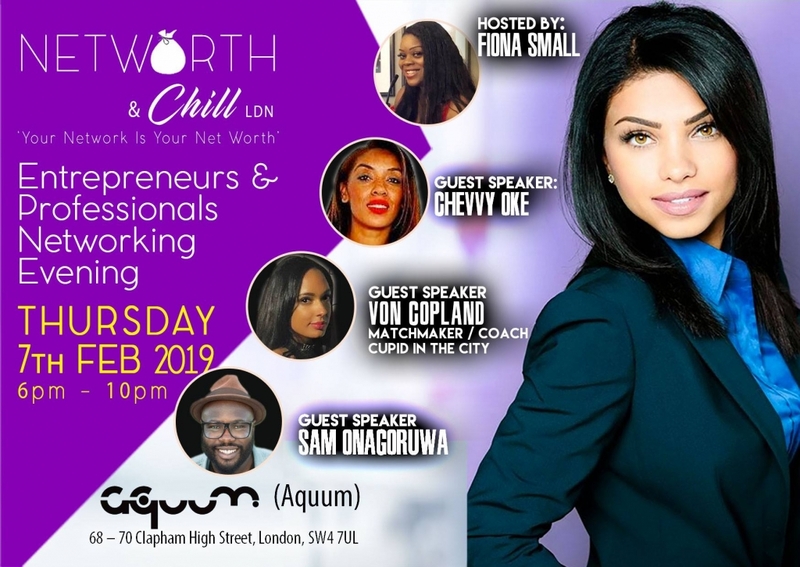 (NOT JUST FOR SINGLES) Thursday, February 7th, 2019 6:00 PM – 10:00 PM AQUUM BAR, Clapham Common The Networth & Chill Team are back in 2019 with another networking session for all those ready to increase profits in business and/or just ready to step up your game in 2019. Hosted by Young Mums Support Network CEO – Ms Fiona Small, speakers for the night will include Chevy Oke, Von Copeland and Samuel Onagoruwa. Ace Of Jzacks will be spinning a few tunes on the evening!